TaylorMade 2018 M3 IRONS. STIFF FLEX. UTX BLACK/GREY STANDARD 49G ROUND. 600 TEXTURED TAYLORMADE. BOUNCE 1.0° 1.5° 2.0° 2.5° 3.0° 4.5° 7.0° 10.0° 10.5° 9.0°. R300 105G 2.1. 370 HIGH HIGH MID. S300 107G 2.0. 370 HIGH HIGH MID. Graphite Shaft - Honma Vizard i60 Regular Flex. 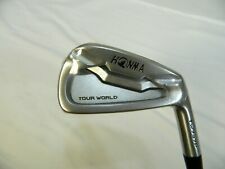 Honma Tour World TW737P - 3 Iron. (drivers, fairway woods, hybrids, single irons, wedges, putters. ). For sale is a Taylormade M3 19 degree 3 hybrid. This club is in 9/10 excellent condition as pictured and has only been used for about a month. NEW CALLAWAY X2 HOT 3 HYBRID 19 DEGREE loft ALDILA BLUE 65 STIFF flex shaft head cover included. TAYLOR MADE P-790 BLACK FORGED # 3 IRON WITH TOUR AD-95 X -STIFF FLEX 39.5"
PXG 0311XF 3 Driving Iron Stiff Steel. Condition is Used. Extreme darkness finish Shipped with USPS Priority Mail. T ay lo rM ad e GA PR l o 19 3i ro n. Cl ub h as o nl y se en 3 b al ls i n a simulator, n ev er been pl ay ed outdoors. Perfectc on di ti on. 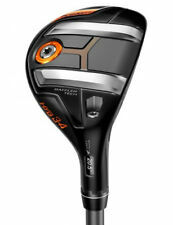 Taylormade RBZ Tour 2 Hybrid. Shaft- Factory 85 gram X flex extra stiff graphite. Notes-Nice club. Sorry no headcover. We strive for the club to arrive to you better than you expect! 6-Well used club that is still very playable. Steel Shaft - TT XP 100 - S300 - Stiff Flex. TaylorMade M3 Iron set 4-AW (4.5.6.7.8.9. (drivers, fairway woods, hybrids, single irons, wedges, putters. ). Model TaylorMade RSi2 Iron. TaylorMade Golf RSi2 Irons. We apologize for the lighting reflections of the shrink wrap, however our goal is to make sure you get exactly what you see. TaylorMade Golf RSi-2 - 3 Iron Only Project X Rifle Steel - 6.0 Stiff Flex - NEW. Steel Shaft - Project X PXi 6.0 - Stiff. Titleist 718 T-MB Single 3 Iron. Titleist Grip (Red) - Standard. All single pieces (drivers, fairway woods, hybrids, single irons, wedges, putters. ). Rest assured! We will not do it. SHAFT: FACTORY REAX 65g GRAPHITE. TAYLORMADE 2016 M2 RESCUE #3 HYBRID. National Golf is an authorized TaylorMade Golf dealer. GRIP: GOLF PRIDE TOUR VELVET ALIGN. GRIP SIZE: STANDARD. GRIP CONDITION: GOOD. New ListingPing Cross Over 3 iron stiff Alta 70 graphite shaft, blue dot. Excellent!! LEFTY! Taylormade gapr mid 3 with aftermarket Stiff Project Hzrdus Shaft. LEFTY! Taylormade gapr mid 3 with aftermarket Stiff Project Hzrdus Shaft.. Condition is Used. Shipped with USPS Priority Mail. NICE 2009 TAYLORMADE RESCUE HYBRID # 3 19 DEGREE FUJIKURA MOTORE F1 STIFF FLEX. Includes head cover and upgraded grip. Great shape but Condition is Used (see all pics). Shipped with USPS Priority Mail. Steel Shaft - TT XP 100 - R300 - Regular Flex. 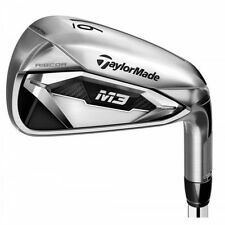 TaylorMade M3 Iron set 4-PW (4.5.6.7.8.9. (drivers, fairway woods, hybrids, single irons, wedges, putters. Right Handed. ). Titleist 718 AP3 Iron Set 4-PW (4.5.6.7.8.9. Steel shafts - TT AMT Black S300 Stiff flex. All single pieces (drivers, fairway woods, hybrids, single irons, wedges, putters. Right Handed. ). Trending at $448.11eBay determines this price through a machine learned model of the product's sale prices within the last 90 days. Used but I’m very good shape. Shaft upgrade with AD-DI hybrid shaft. 95 g stiff flex. Supposed to be 1 degree up but never verified. Great club and great shaft.